Can you judge an eaterie on its fishfinger sandwich? This was what I wondered to myself after a fantastic one at The Suffolk Kitchen. Well I think you can, when it’s constructed from thick doorstop wedges of homemade white bread, housing hot crunchy fillets of flaky white fish, oozing with creamy homemade tartare, yes you can. Oh, and not forgetting the triple cooked chips. And by my reckoning, if you can’t, this fish finger sandwich certainly paves the way to the possibility that, The Suffolk Kitchen really is quite likely to be, very good indeed! The homemade burger that ‘The Man’ ravaged was apparently delicious and the excellent children’s menu that ‘The Boy’ chose from was equally well received. The place certainly looks the part with a modern, bright interior, Welsh tapestry upholstered banquette seating and cool art. And in addition to all this, is the simple but perfectly formed wine list, offering a range of wines from £2.50 a glass. Now, I’m no wine buff but I’m no fool either and I’ve had many a meal in Cheltenham where plonk is poured at horribly over-inflated prices. We all know the approximate price of a familiar bottle of wine and it does gall to pay over the odds for the privilege of drinking it in a restaurant. 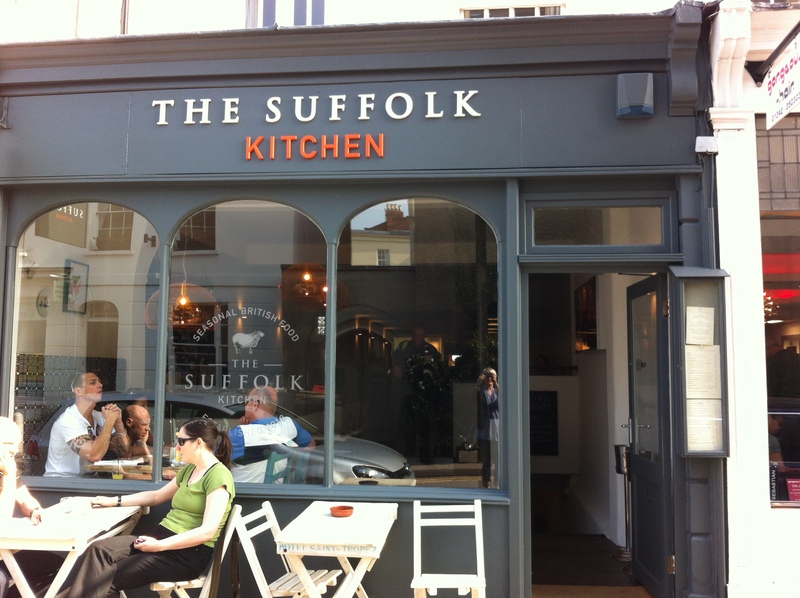 So well done to The Suffolk Kitchen for playing fair! 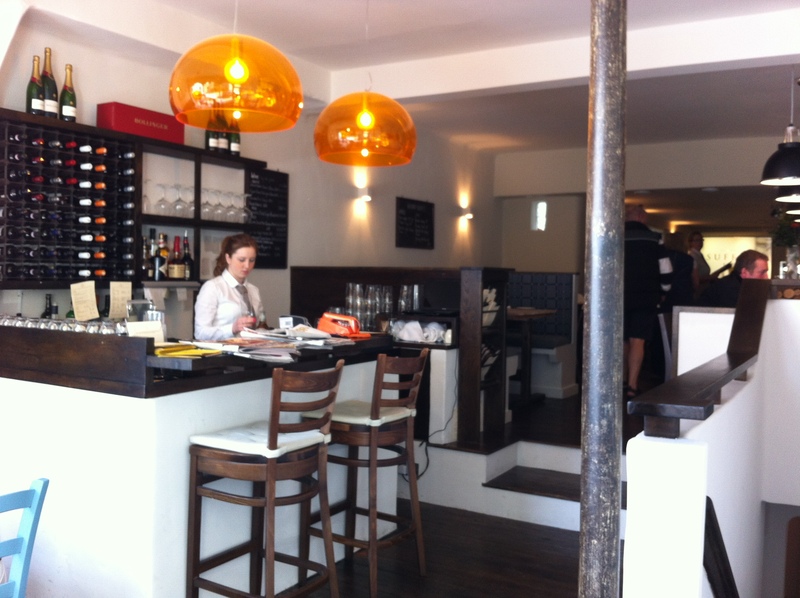 I’m definitely going to, ‘watch this space’ and would love to hear other reviews of Cheltenham’s promising new addition. This entry was posted in Discoveries on my Doorstep and tagged Bistro, Cheltenham, Montpellier, The Suffolk Kitchen. Bookmark the permalink. Charlie it’s so great to read this. Katy Dymond seems to hang out here all the time, she loves it. She says it’s great for brunch too? Cheltenham is a bit of a dearth for decent modern restaurants and it makes me very happy to hear a new one has opened up that is good. I hope you’ve told them you wrote about them! Well I think we should meet up there on your next visit! It’d be good to see Katie too. Loving your France posts, went near Nice myself at half-term, was fabulous! What other beans exist?!! Glad it was good otherwise though- we got a living social voucher and had a gorgeous dinner a few weeks ago, we’ll definitely go back…hey perhaps the 4 of us should go!